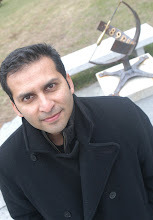 This is a guest post by Muhammad Aurangzeb Ahmad. He is behind the website Islam and Science Fiction. He recently participated on a panel on Science Fiction and Islam at the American Cultural Association Conference, and here is his post about it. When one thinks of Islam or Muslims Science Fiction is usually not the first thing that comes to mind. Last week I was part of a panel on Science Fiction and Islam at the South Western/ Texas American Cultural Association Conference along with Rebecca Harkins and Waheeda Deborah Bilal both of whom are studying this cultural phenomenon from an Academic perspective. My main focus was to give an overview of Science Fiction themes which have been employed by Muslims as well as how Islam and Muslims have been portrayed in Science Fiction in the Anglosphere. Before one can even begin talking about this subject the term Islam has to be delineated because Islam can refer to a religion, a set of cultures, a civilization, an ethos etc. Notice that all of these are inter-related but they are not the same. Everything which is part of the religion is not necessarily part of Islamic cultures; additionally there are things which are considered neither positive nor negative by the religion and yet they are part of the Islamic cultures. Thus the context in which this problem is to be studied is a cultural and civilizational context. In this view "Islamic" science fiction may be produced by Muslims, Christians, Jews, Rastafarians, Hindus, and even Atheists. The Islamic civilization arose in the Middle East which had a strong tradition of fantasy literature. Thus consider classics like the Arabian or 1001 nights (whose foundation was actually Hazar Afshan or Persian 1001 Nights), the Islamized Ramayan of Indonesia or the world's largest fantasy epic Tilism Hosh Ruba which is in Urdu. Many of these stories have proto-science fiction elements and cannot be called science fiction per se but it does show the capacities of their respective cultures to produce speculative fiction of high quality. However moving forward to the contemporary era we do not see science fiction to be an integral part of literature in any of the Muslim countries. That of course does not mean that science fiction has not been produced in these cultures. These range from time travel stories from 19th century Egypt, some of the earliest Feminist Science Fiction in Bengali from 1906 to Islamic Utopias set on other planets in the later half of the 20th century. Then there is a whole genre of fiction by Heterodox African American Muslim groups from the 1950s onwards which was created as a response to racial oppression. In the last decade or so both the quality and the quantity of Science Fiction coming out of the Muslim world has increased. The Islamic world has yet to produce the likes of its own Arthur Clarkes, William Gibsons, Stanlislaw Lems etc. One good point that the audience raised, to which I only had a partial answer was that why is it that Science Fiction has not taken off in the Islamic world despite the fact that Muslim cultures themselves have a rich tradition of speculative fiction. Part of the reason is the move away from speculative literature to to more realist fiction ever since the advent of colonialism when such form of fiction was added to the list of reasons why the Muslim world had gone into decline. The second blow comes from some conservative elements of the religious community who frown upon any form of fiction as a waste of time. The net effect being that Science Fiction never really took root as an integral part of the literary culture in these countries but these things have been changing in the last two decades. Waheedah Deborah talked about the representation of Muslim women in comics which seem to oscillate between women who are totally covered in Burka or women who are almost naked as being part of the exotic East. Here one is reminded of Edward Said's critique of Orientalism that many of the motifs regarding Muslim women which were handed down to the modern world by the medieval era persist to this day. Thus the depictions of the Muslim woman are exhausted in her either being an oppressed creature waiting to be rescued or being a whore; she cannot be herself. Overall it leaves much to be desired. Rebecca Harkins who was the session chair discussed the positive and negative portrayals of Muslims in Science Fiction. 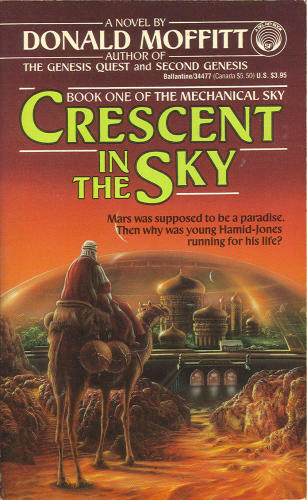 The stereotypes of Muslims that prevail in the larger popular culture are also present in Science Fiction and related genres: These range from vitriolic representation of Muslims by Mack Reynolds’ in Border, Breed, nor Birth where they are incapable of civilization to Mike McQuay's Jitterberg set in a dystopian future ruled by Tyrannical Arab Muslims. The alternative history genre fares much better e.g., Donald Moffitt’s Crescent in the Sky presents a vision of an enlightened Islamic Empire spanning multiple star systems, Steven Barnes depicts an alternative North America with the roles of the Europeans and the Africans reversed but with the African Muslims having a more humane treatment of the subjugated Europeans as compared to what we see in our history. Overall the panelists agreed that there is lot of material on this subject which is out there but it has not been collected or categorized and while it is getting more notable, this genre has a long way to go. This may be off-topic, but the first example that came to mind when I read the headline was Frank Herbert's use of Islamic concepts, terminology, and history in DUNE. That is actually very relevant. I also discussed this during the panel. The character of Paul Artrites is inspired from Middle Eastern prophets especially Prophet Muhammad (pbuh). I attended a panel a couple of years ago in which someone presented a paper on the 2004 "Battlestar Galactica" American TV series, and it struck me that the Cylons were probably intended to represent Muslims, and that the series was in some ways an allegory for questions about the relationship between the United States and Islam. Also - in the supplementary material in the back of Dune, Herbert gives the origins of the customs and language of the Dune people to Arabia and Islam from the bygone era on Earth (I don't think he actually provides the time frame). So yes - he talks about explicit connections to that - and given the desert environment, we can see why. Ben: BSG was clearly a post 9/11 TV series. The attack on the unsuspecting population of Caprica was clearly modeled on 9/11. However, the writers kept changing their perspectives (and they were very smart about it). For example, while the Iraq war at its peak, humans were conducting (and justifying) suicide bombings against the cylons. Ditto on the debate over torture. It was placing the audiences on the opposite side of the real world events. They also did that politically with the pro-choice President on BSG passing a strictly pro-life law. They knew what they were doing. Alas - their last episode was bit of a cop-out. A darker ending would have been superb! Very interesting post, thanks so much for this. Understanding that there is still a lot of "collecting and categorization" to go in terms of Islam-influence SF is actually very exciting for myself. I love the idea of witnessing the creation of a community around both the genre I love and a culture that is both adapting it and changing it--I'm sure Islamic writers will offer fresh ideas for where the genre can go in the years to come. This is definitely a topic I'll be paying attention to, hopefully the community building that is necessary will grow and expand. Off-topic: A nudge for "The Artist"